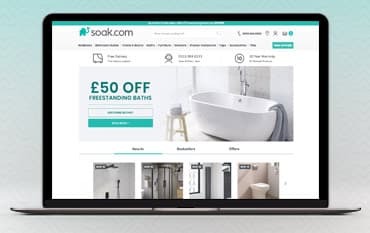 Where do I use my Soak.com voucher code? Soak.com boasts a huge range of bathroom suites including shower bath suites, designer bathroom suites and suites for everyday bathrooms. They also sell a huge array of toilets and basins as well as freestanding, straight and shower baths. If you’re more of a shower person you can also find a vast selection of showers including exposed shower sets, concealed shower sets, premium showers, digital showers and electric showers. There’s even a huge range of shower enclosures and taps to match your shower and bath, as well as vanity units, cabinets and storage options, all of which make both useful and stylish accessories for your bathroom. If you’re looking for a wider range of accessories you can find mirrors, lighting, towel rails, soap dispensers and much more, as well as ceramic, porcelain, quartz and slate tiles that will not only look great in your bathroom but your kitchen too. Soak.com stock a huge selection of bathroom accessories that are sure complement your bathroom furniture and decor perfectly. Shop for mirrors, mirror cabinets, lighting, towels, bath mats, laundry baskets and bins as well as soap dishes and dispensers, toilet roll holders, towels rails and rings, tumblers, storage options and accessory sets. You can shop for your accessories by type and style, or you can check out the different ranges available such as: chrome, boldy black, grey matters, copper and marble, native naturals, printed patterns, perfectly pastel, joseph joseph and anorak- all of which feature unique and stylish bathroom accessories for every preference and taste. Not only to Soak.com sell bathroom furniture, suites and accessories they also stock a huge selection of tiles for floors, walls, the bathroom and the kitchen. Discover tiles in multiple colours including black, blue, grey, multicolour, red and white, or shop by material to find a wide selection of tiles in ceramic, porcelain, quartz and slate. As well as all this, Soak.com also have tons of tile accessories including grout, sealant, adhesive and primer to help make your tiling process easier and more affordable. As long as the items are in the condition you received them and in the original packaging you can return them to Soak.com within 14 working days. Free standard delivery is available to most of the UK mainland on orders over £399. Find more delivery information here. I only received a few of the items I ordered. What do I do now? Make sure you have your order number and/or reference to hand contact Soak.com’s customer service team. Soak.com is a top retailer of bathroom furniture, suites and accessories. With a huge array of traditional and contemporary suites, toilets, basins, baths, furniture, showers, shower enclosures, taps and accessories, Soak.com allow you to kit out your bathroom with high-quality pieces that are stylish and long-lasting. Shop online at Soak.com and use a discount code from us to save money on your order, you can also enjoy huge discounts in the offers section and when you sign up to the newsletter.